For the second time this season, the Orange swept a season series against a former Big East foe. In today’s rendition, Syracuse took down Boston College 67-56 to claim victory number two over the Eagles this season in front of the largest crow. 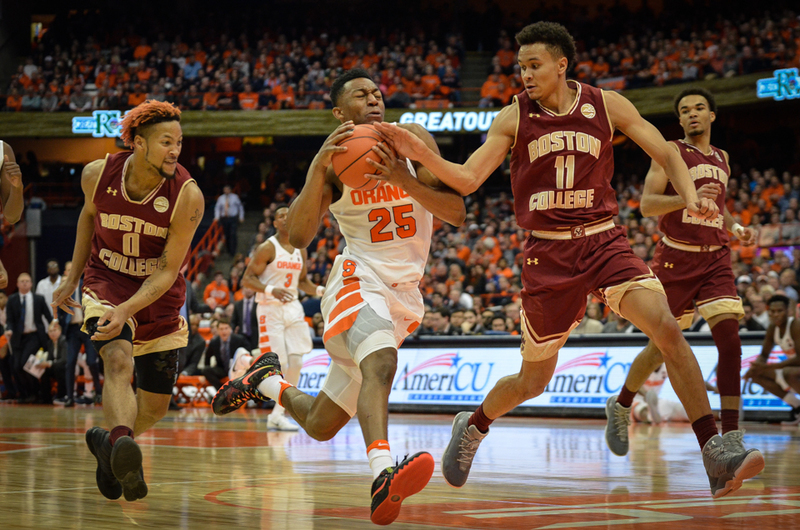 Much like the meeting out in Chestnut Hill, the Orange started off sluggishly offensively. However, it wasn’t nearly as rough of a start as the Eagles. BC began the game shooting 0-for-11. The Eagles also began the game with Ky Bowman on the bench because of a minor team issue. When he checked in, he picked up the Eagles first jumper with 13:47 left in the first half. Bowman is a guy who almost never rests, so the four minutes he was out certainly helped the Orange gain early momentum. There is one name that doesn’t jump out in the scoring department for the Orange. It’s Elijah Hughes. But don’t take that as a bad thing. Hughes was all over the floor in other areas of the game. He was diving for loose balls that led to Orange possessions, hauled in 5 rebounds and had another roof-raising block that is becoming a staple of the team’s defensive repertoire. Up next for the Orange comes a reeling NC State team who came into today having lost five of their last seven games, with one of those wins being a miraculous comeback in the final minute against Clemson. Syracuse brings its 5-1 road record to Raleigh. SU is 3-1 all-time on the road against NC State.